L-R: Lagos State Governor, Mr. Akinwunmi Ambode (4th right), with General Manager, Research, Planning, Environment (RPE), National Inland Waterways Authority (NIWA), Chief Femi Ajisafe; Area Manager, Lagos Office, NIWA, Engr. Muazu Sambo; Managing Director, Lagos State Waterways Authority (LASWA), Ms. Abisola Kamson; Commissioner for the Environment, Dr. Babatunde Adejare; Managing Director, NIWA, Barr. Danladi Ibrahim; General Manager, Marine Service, NIWA, Engr. Olusegun Balogun and General Manager, Corporate Affairs, NIWA, Mr. Tayo Fadile during a meeting with the Governor in Abuja, on Wednesday, April 20, 2016. L-R: Lagos State Governor, Mr. Akinwunmi Ambode, discussing with Managing Director, National Inland Waterways Authority (NIWA), Barr. Danladi Ibrahim and General Manager, Marine Service, NIWA, Engr. 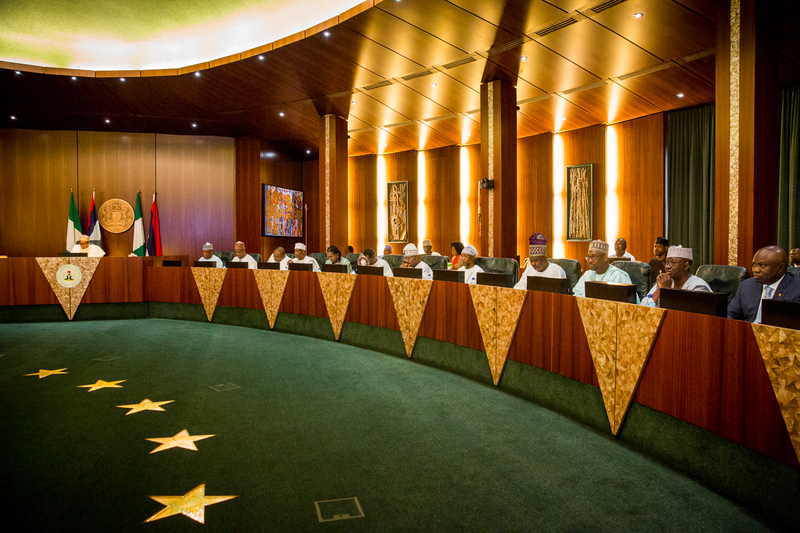 Olusegun Balogun during a meeting with the Governor in Abuja, on Wednesday, April 20, 2016. L-R: Lagos State Governor, Mr. Akinwunmi Ambode (2nd left); Commissioner for the Environment, Dr. Babatunde Adejare; Managing Director, National Inland Waterways Authority (NIWA), Barr. Danladi Ibrahim and General Manager, Marine Service, NIWA, Engr. Olusegun Balogun during a meeting with the Governor in Abuja, on Wednesday, April 20, 2016. R-L: Lagos State Governor, Mr. Akinwunmi Ambode (2nd right), with Managing Director, National Inland Waterways Authority (NIWA), Barr. Danladi Ibrahim; Managing Director, Lagos State Waterways Authority (LASWA), Ms. Abisola Kamson and Area Manager, Lagos Office, NIWA, Engr. Muazu Sambo during a meeting with the Governor in Abuja, on Wednesday, April 20, 2016. The Governor who spoke when he received the Director General of the Nigeria Employers Consultative Association (NECA), Mr Olusegun Oshinowo and representatives of various multinational companies at the Lagos House, Ikeja, said youth unemployment is one of the tripod of development on which his administration is committed to tackle headlong, aside security of lives and property and improving social infrastructure. 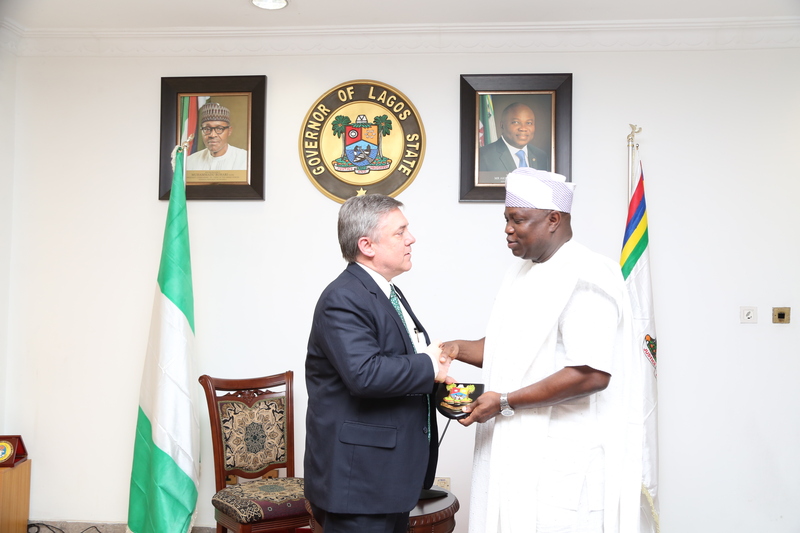 Lagos State Governor, Mr. Akinwunmi Ambode (right), presenting a State plaque to Chairman/MD, Chevron Nigeria Limited, Mr. Clay Neff during a courtesy call to the Governor, at the Lagos House, Ikeja, on Thursday, March 17, 2016. 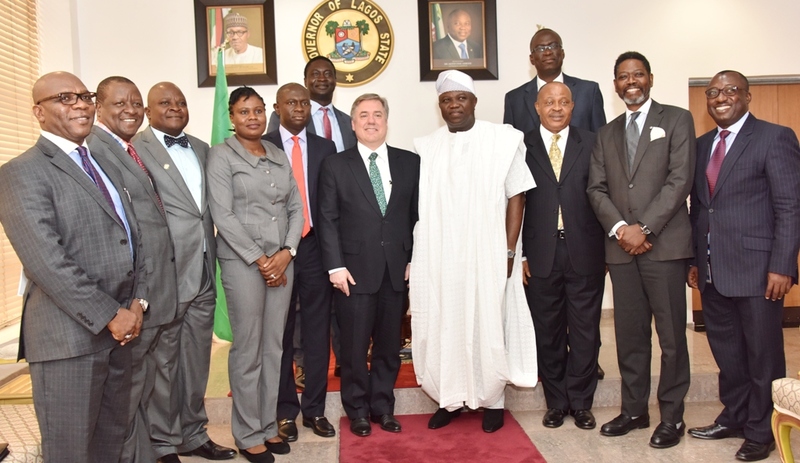 Lagos State Governor, Mr. Akinwunmi Ambode (4th right), in a group photograph with Chairman/MD, Chevron Nigeria Limited, Mr. Clay Neff (6th left); Commissioner for Energy & Mineral Resources, Mr. Wale Oluwo and others during a courtesy call to the Governor by Management of Chevron Nigeria Limited, at the Lagos House, Ikeja, on Thursday, March 17, 2016. 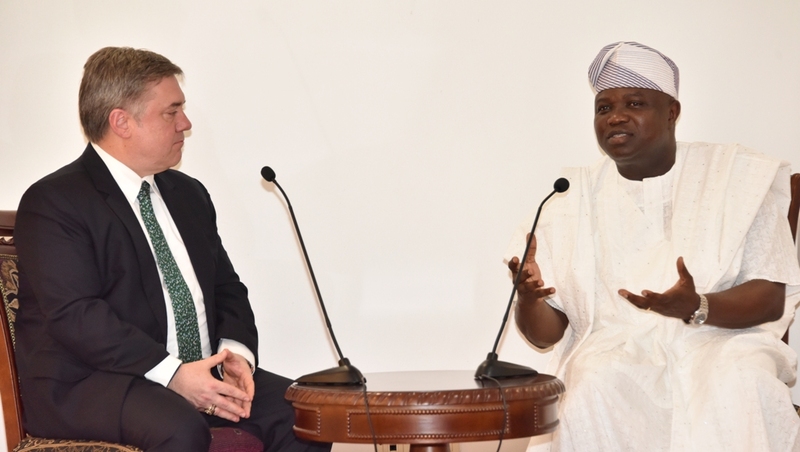 Lagos State Governor, Mr. Akinwunmi Ambode (right), with Chairman/MD, Chevron Nigeria Limited, Mr. Clay Neff during a courtesy call to the Governor, at the Lagos House, Ikeja, on Thursday, March 17, 2016. “In areas of skill acquition, you have so much to offer and the truth is we need to dissipate the energy of our young ones to different things that can enhance their creativity and that way we are better way as older people to live a more comfortable life. On that note I want to say that we are willing as a government to take on your offer that you are giving us, it’s collaboration in the best interest of all of us,” the Governor said. 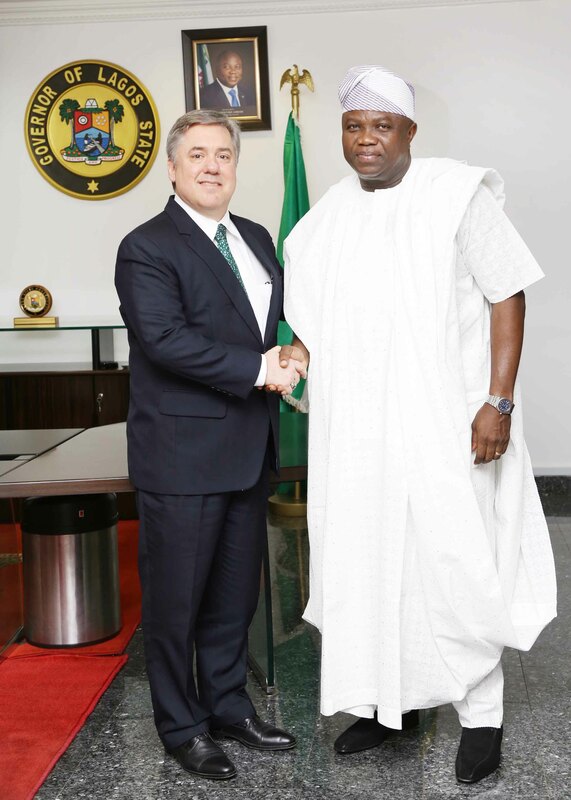 The Chairman and Managing Director of Chevron Nigeria Limited also paid a courtesy visit to His Excellency, Governor Akinwunmi Ambode, to express his appreciation of the existing business relationship between the Chevron Nigeria Limited and Lagos State Government and to explore further areas of co-operation and mutual understanding. Mr Clay Neff also stated that Chevron has been in Nigeria for 50 years and currently has its head office in Lagos state. The company strives to be the most admired energy company for people partnership and performance. 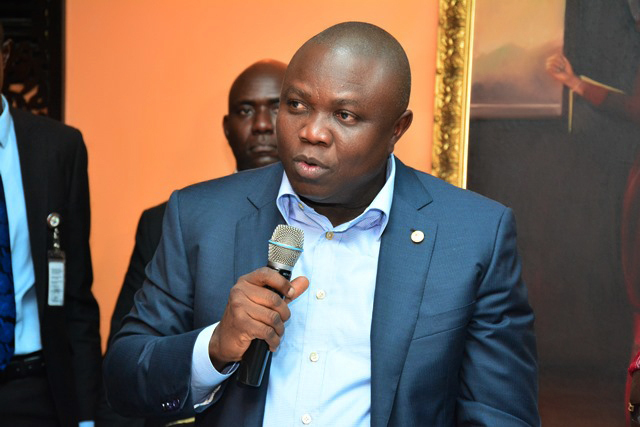 Governor Ambode said that Chevron Nigeria has been a good corporate citizen in the area of health and in being responsive to societal demands in the state. He added that this relationship can be advanced to move the nation forward as Lagos is growing into an oil producing state. The governor also encouraged other corporate organizations to imitate the spirit driven by Chevron Nigeria in their activities. 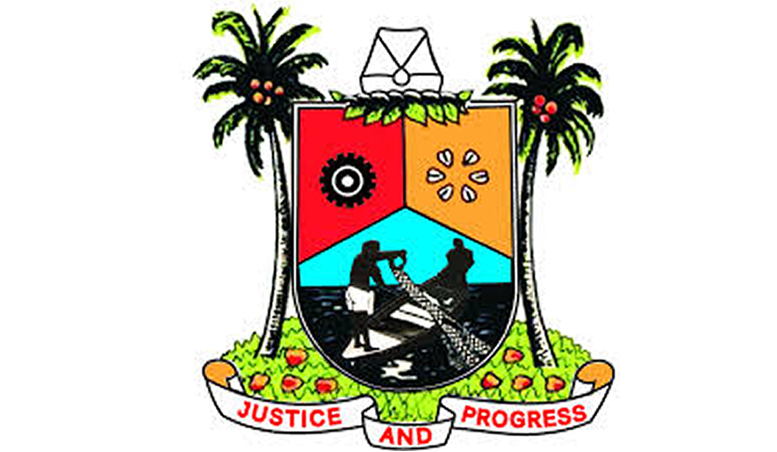 Lagos State Governor, Mr. Akinwunmi Ambode on Wednesday constituted the Christian Pilgrims Welfare Board with a charge on them to discharge their duties without fear or favour. In a statement signed by the Secretary to the State Government, Mr. Tunji Bello, the six-man membership Board is expected to coordinate intending pilgrims from Lagos to this year’s pilgrimage to Jerusalem. The Board has Bishop Sola Ore as its chairman with Ms. Jibike Babatunde, Mrs Arin Ajose and Pastor Laja Diele as members. Other members of the Board include Mr. Tunde Temionu and Mr. Thomas Adefolusho Adekoya. 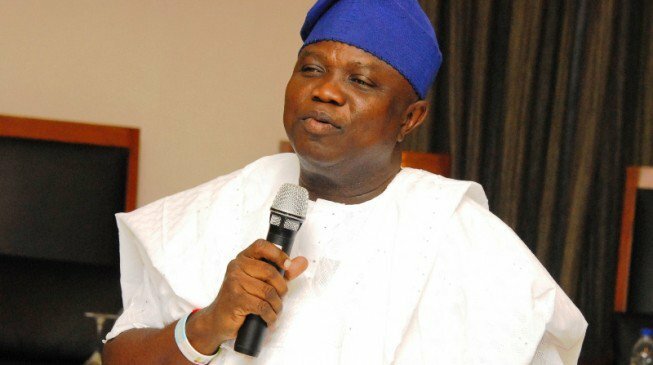 Governor Ambode in the statement also urged the Board to ensure a hitch free exercise and adequate welfare for the state pilgrims in the Holy Land.